Providing you the best range of 6 benzyledenine with effective & timely delivery. Benz is a Plant Growth Regulator belonging to a class of Cytokinin. Benz is used alone or in combination with other substances such as Gibberlins. 6-BA is the first generation synthetic Cytokinin. It can inhibit the degradation of chlorophyll, nucleic acid and proteins, promote delivery of amino acids, inorganic salts and growth regulators to applied positions. It helps plants to keep green and retard ageing. It can be used in Agriculture, Horticulture, for plants at different stages from germination to harvest. It is an inhibitor of respiratory kinase in plants and increases post-harvest life of green vegetables. Protein biosynthesis, increasing cell division. Foliar Spray :- Mix 2 gm powder in a given solvent, shake thoroughly & spray @ 1 ml of ready Solution in one Liter of clean water at sprouting to fruit development stages. 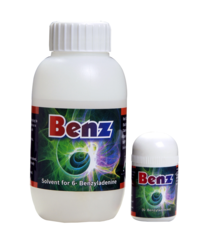 Compatibility :-Benz is compatible with almost all agrochemicals.